HMWK: Less Value or Valueless? If I had to name one educational author who sets educators off, it would be Alfie Kohn. The Educator’s PLN. http://edupln.ning.com. was fortunate enough to convince Alfie Kohn to talk with well over 250 educators about his views in a live Chat. Alfie is outspoken on a number of educational topics not the least of which is his stance on homework. No matter how Kohn positions it, and irrespective of the research used to support his position, all that some educators ever hear is that teachers should not give homework because it doesn’t improve or in any way positively affect learning. This flies in the face of a traditional tenet of education, “Thou shalt Give Homework”. Kohn’s positions bring out the best and the worst in some people. One great example of academic debate at its best has been on-going over a period of several days. Two members of The Educator’s PLN, George Haines and Tim Furman have continued the most scholarly, thoughtful, and respectful discussion on the subject of Alfie Kohn that one could hope for. The vocabulary is inspiring. You have to love all those big educational words. All kidding aside, I have great respect for both men and their positions. It is a refreshing change from some of the name calling and disagreeable discourse that I have witnessed in the recent past. Now that the Alfie Kohn video has been placed on my class’s Ning site and my students have been assigned its viewing, I need to strategize what they should take away from the experience. I am not creating Minnie me’s. I do not want to impose my will and a homework policy on them to guide them through their careers without them understanding or buying into it. After all, I am not an administrator. Many of my views on homework were not my views through much of my career. Having my own children in school gave me a perspective that I never had in the first half of my career. I have come to appreciate that a student’s day in school begins at about approximately 8 and ends at 3. Many, but not all, are often involved with extra-curricular events for an additional two hours. This puts kids home between 5:30 and 6PM. Work in a little downtime and dinner and it is 8 pm. Of course the student is now ready to work, because it’s homework time. Each teacher has only assigned about 20 to 30 minutes of work, so each teacher feels that the assignment is not too much. That would be okay if the kid did not have five teachers all thinking the same thing. That could be on a given day two to three hours of homework. It is now 11 PM. I understand that does not happen every night, but I must wonder how often does it happen? I do not know an adult who would work those hours for any number of days in a week for no pay. There are actually departments, schools, and districts that enforce homework policies requiring teachers to give homework each and every night. Skills and drills are important to some teachers and rarely important to kids. Some students might benefit by doing them. What about those who do not need those drills because they have a thorough understanding? How do those students, who do not need the drills, view them? If they clearly understand and can do the work, why are they drilling? Might they feel as if it is punishment? Can we assign the drills to those who need them and not to those who need them not? Is that a question of fairness? How can we say that only some of the students will get homework because they need to drill their skills? Are we calling some of our students dumb (their perspective) ? I would love for my Methods students to realize that, if homework is important for the teacher to give, it should be important for the students to do. It should be creative and reasonable, because we are requiring overtime without compensation. We would resent that as adults, so why do we expect kids to buy into that concept without pushback? I love the fact That Alfie Kohn, George Haines, Tim Furman and my Methods students all challenge me to think, and reflect in order to amend, or change many of the traditions of education I followed so stringently for so many years in teaching. I only regret that I did not have the ability to do this earlier. That is what motivates me to work with pre-service Teachers. I think I will assign the reading and responding to this post as a homework assignment. I was somewhat stumped as to how to engage my Methods students after two snow days and the Presidents’ Day Holiday. My worries were short-lived, since I developed a Ning site for my Methods’ students, so that they could continue learning even without the use of college grounds or a classroom. I am not a tech geek, but a practical educator. I know that I need to engage my students beyond the classroom in time and space. After the first few responses I began to question my teaching methods. The early student responses were saying that technology was an encumbrance to education. I had one student argue that cashiers could not make proper change unless the cash register told them how much change to give. The argument was blaming the technology for the cashier’s inability to make change in his or her head without the aid of the register. I did not point out that the cashier probably would not have had that job if the technology was not compensating for what the cashier did not learn in school. We sometimes view the same things, but perceive them differently. Of course, I was upset with the initial responses. I wanted these students to learn what I know and take it further. Based on the initial responses, that was not going to happen. I felt that I had gone wrong in my presentations of technology as a tool in education. How could these students move education forward, if they fail to understand the technology component as clearly as I do? Yes that is totally arrogant on my part, but it is important to me to have my students be relevant. 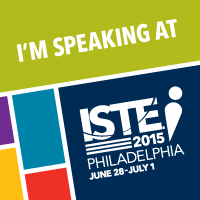 Technology, to me, makes them relevant educators. This was a little too much to deal with. After all, the Olympic games were going on. I was upset, but I decided to put it aside to watch and enjoy the Olympics. Of course that did not work out. The initial discussions from my students were turning over in my mind. Why didn’t they get it? I know that I taught that technology is only a tool and not the education. As I watched the Olympics I was thinking of how I could get a redo on this topic of technology as a tool for educators? That was the very moment that NBC, trying to fill a period of time when nothing was going on, did a piece on the garments created for the skiers to keep them warm and dry, as well as massage the athlete’s muscles. It was technology at its best. From that point forward, I honed in on all of the technological advances that helped the Olympic athletes. Clothing, sleds, skis, gloves, skates and anything else that an athlete needed was being tweaked by technology. Technology was the tool to help the athlete complete the event. That is when I saw it. If learning was the event and students were the athletes what would they need to get to the end of the event? What technology could we provide to get them to achieve the goal. We did not need suits, gloves, or skis, but tools for collaboration, exploration, and communication. If athletes in the Olympics use tools of technological advancement to succeed at their events, then students in schools may use tools of technological advancement to succeed at learning. Teachers are not replaced by the tools, they become the coaches. Much like today’s athletes who participate in various events in the Olympics, students participate in learning. To succeed in attaining that goal, technology is a tool to get the student there. It enables him or her to get there faster and with richer experience then in the years past. After I came to this realization and what I considered a great analogy, I went back to the discussion page of my class Ning site. I was happy to see a large number of contributions to the discussion. Many of the new entries exhibited a clear understanding of technology as a tool for learning and not the end result.I may have been to quick in my early assessment. Many students were smart enough to quote not only my words from classes, but also many of the wise words from my Blog posts. They were using technology to pump up the professor’s Ego. After all of my reflection and assessment, I may have accomplished my objective with a number of my students without going over it again and beating their knuckles with a ruler. That was the old school method. Everybody loves snow days. If you teach in an area where it does not snow, you are really missing out. It is a day that causes students and teachers look forward to each winter. With my immersion into the world of social media I used this snow day as a day to engage and learn from other educators. To me snow days have become Twitter Days. My other choice was to shovel the driveway. Since I would need clearance from a cadre of doctors, I opted for Twitter. I require my college students to be involved with a private Ning site that I created for the class. A Ning site is similar to a Private Facebook site. 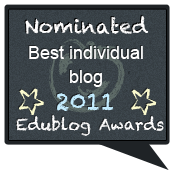 It was actually the model for The Educator’s PLN, http://edupln.ning.com/. Since we had two snow days in a row and next week contains a holiday, I will not see my students in their seats at schoolhouse for awhile. This means that I must be a little more creative and use the ning site to engage them, so that we may continue to grow and learn. I shared this endevour with my Personal Learning Network on Twitter. I love the ability that I have to connect with my students 24/7 without regard to walls or distance. I acknowledge that I am working with college students who all have technology access. This is a big plus for me and not a factor enjoyed by all elementary, or secondary teachers. It should however, be a direction for education to take. Getting the technology to students might be less of a problem than trying to change the culture for this to be successful. Two members of my PLN forced me to consider a few things on this snow day of twitter exchange. Jennifer Ansbach, @jenansbach, a secondary English teacher from New Jersey and Brian Nichols, @bjnichols, a forward thinking Elementary Principal in Virginia are two respected educators who add value to my PLN by thoughtfully and respectfully exchanging and challenging ideas. After reading my tweet about using a ning, because I had no access to the schoolhouse, Jen tweeted about her plan to engage her students at home with a Webinar delivered by a Ustream feed. This is another great way to deliver material to kids outside the schoolhouse. Jen’s students balked at the proposal stating that they felt it would be “creepy” for their teacher to see them in their homes. It doesn’t matter that it doesn’t work that way. Thank god. But it does point out the need to change the perception that learning can only take place in the Schoolhouse. Brian was asked by someone to give his perspective on some educational topic and Brian was questioning what impact or value an elementary principal’s perspective would be in a discussion. This is a principal who supports teachers who have third graders blogging. His perspective could very well enlighten people about things that they do not yet know about. As educators we read about education and its history quite often. We have come to understand that American towns were centered and built around the Schoolhouse, library, and Church. I would suspect a saloon or two was also in the mix. The idea being that people needed to get access to the information held within those places. Saloons were a different need. Today schoolhouses are often a source of pride or tradition for communities. People pay a big price for them, so people feel that they should be showcased. There is a history in many communities of generations attending school in the schoolhouse. The schoolhouses are getting bigger with more bells and whistles, but there are question that need to be answered. Are schoolhouses getting better? Do bigger and more elaborate schoolhouses provide better learning? How far have we come from the little red schoolhouse with the rows of chairs and the chalkboard at the front of the room. The teacher’s desk was always up front to maintain order. Take out the Franklin stove for heat and the Little Red Schoolhouse looks almost familiar when compared to many schoolhouses today. Now, I need to assemble all of the pieces of this jigsaw of a post. Although schoolhouses are considered institutions of learning, in the course of a person’s lifetime much of the learning for that individual will take place outside the schoolhouse. Learning is not confined to the schoolhouse. That concept flies in the face of our priorities, since we spend so much money building bigger, and better schoolhouses in the hope of bigger and better educations for our kids. This has been imprinted on our culture. How do we change these perceptions, for perception is reality? We need supportive educational leaders like Brian to continue encouraging teachers to engage their students in learning anytime and in any place. Encouraging and teaching kids at an early age gives them the tools and skills to go further on the secondary level. Secondary teachers like Jennifer will not be met with resistance from students or parents when proposing learning outside the schoolhouse. I am not proposing technology driven homework assignments, but a shift in an approach to learning.It will come to be expected by students and parents As these students get to the big red schoolhouse of college, they will be learning on their own with the guidance of their teacher without a need for the chalkboard, rows, teacher’s desk, or the Franklin stove of the old model. There are so many other obstacles to overcome before this can change. Equal access to technology, professional development for teachers, professional development for administrators, and professional development for parents are all necessary to begin to change the culture. We need to look at our schools as schoolhouses that may be limiting learning and not encouraging it. We need to understand that we do not have to travel to the schoolhouse to get the information. The information now comes to us anytime, anywhere. We may however, want to now consider where to place those saloons. I was attending college in West Virginia when Marshall University’s football team went down in a devastating plane crash. The Movie We are Marshall has always had a special meaning for me as a result of that geographical and emotional connection. I was always moved by the community rallying to the support of the team and the University. As I remember, 40 years ago, the sense of community was as true in life, as it was portrayed in the movie. The sense of community has a great deal to do with social media as I see it. There are no rules in social media. There are pockets of groups that are governed by a sense of purpose for a specific interest or a specific topic. This can be by an occupation, an industry, a family, a common disease, a hobby, a heritage, or any common experience of those who formed that community. What governs the group is its common purpose to advance its cause in a collaborative effort by the members. There are some social media sites that establish rules for their site. They can also establish them to be private or public. There is but one final consequence for those who ignore the rules on a site. They are banned from the group. It is a setting on the site that group managers have. Twitter is totally public. One may determine who to follow and even, to an extent, who will follow back. There is a setting for blocking followers from contact. These determinations are made by whom an individual wants to include in their personal network. Each tweeter sets his or her own standards for acceptance of his or her network members. 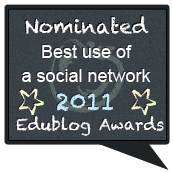 I, along with many other educators, have set up Professional or Personal Learning Networks, PLN’s. Our common interest is Education. Some educators narrow that down to specific subject areas, and some are generalists. Having taught in the K-12 world for 34 years and now Higher Education for the last three years, I consider myself a generalist with a leaning toward increasing technology as a tool for education. I have found technology to be a common interest of many educators on my PLN since that is what brings us together in this medium. That is the backdrop for the facts about the formation of #EdChat. I think this needs to be recorded somewhere, so that those who join today understand what it is and not be confused by what others say it is. I along with Steve Anderson and Shelly Terrell are the founders of #EdChat. It grew from our experiences with Twitter and our PLN. I often engage members of my PLN in discussions about education. The topic of choice is usually reforming Education to get it more involved with Technology tools for learning. For my PLN, this is the topic that binds us. Since some meaningful and substantive discussions were only visible to members of my PLN who were online at that time, I wanted more. Collaborative learning works best when you can collaborate. We had the subject, but we needed the people. Shelly suggested that we post out a discussion topic and we hashtag it so that anyone could follow. #EdChat was an unused hashtag so we put it in place. We soon found that others had ideas for topics. Steve Anderson contributed the #EdChat Poll. Each week we place 5 topics on a poll for people to select a topic for discussion. 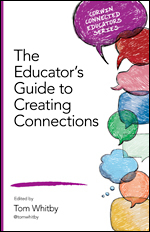 Topics are suggested, or they are developed by popular discussions on the PLN that week, or they are topics that are being discussed by educators at various Educational conferences. Again, I remind you, many of our PLN members have technology in common, and it is a concern that comes to the surface often. This is how we started and developed #EdChat. These are the facts and not the myth. I believe we started in August of 2009.We have now grown beyond or own PLN. Our topics, however, have remained true to our objective. They are: general educational concerns, often Technology-in-Education concerns, reform topics, and general Pedagogical concerns. 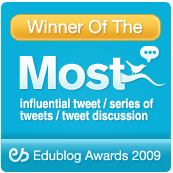 We originally had one EdChat discussion on Tuesdays, at 7 PM EST. This was not meeting the needs of many of European members in consideration of the different Time Zones. 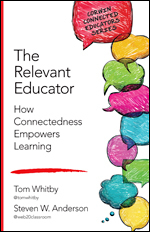 We added a 12 noon EST EdChat to include them. This allowed more coverage of several topics and avoided duplication. We use the first topic choice for our largest group at 7 and the second most popular topic for the noon session. We try to recycle Topics not selected and we add new Topics from suggestions and discussions on the PLN or the EdChat discussion. 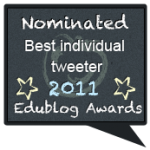 We have archived most of our EdChats, but we did not do this at the beginning. 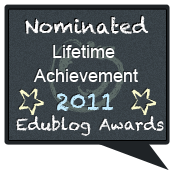 Our EdChat archives reside on The Educator’s PLN Ning site, http://edupln.ning.com. #EdChat has now become more than when we started. 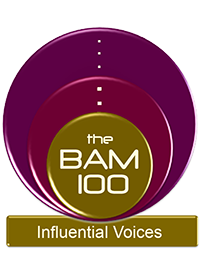 We have received national attention in more than one educational journal. We have been represented at a number of Educational Conferences. 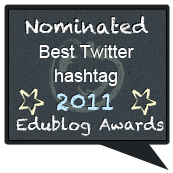 The hashtag #edchat is now tagged on to many educational tweets making it a 24/7 depository of educational tweets. That takes it beyond the 7 and noon use of the hashtag. The community that is Edchat, determines the membership. Anyone interested in the discussion of the topic chosen by the community is welcomed to join. The value of members’ tweets is determined by participating members. If they want to engage another member they will. Often there are satellite discussions going on within an EdChat. It is like a great party where members can travel from one group to another and engage in a discussion that was prompted by the original Topic. We have hundreds of participants and over a thousand tweets in a one hour period. EdChat is about an exchange of ideas. It has had an impact on the educational community based on references in Blogs, journals , and conferences. As one of the founders of Edchat I have laid out the facts as I know them. I hope that this dispels any misinformation that people may have about Edchat. It is a community of collaborative Educators whose only agenda is to improve education from their perspective of understanding. Often, but not always that is a perspective in the use of Technology. It should be noted that this is a formula that was successful for us. It is also being duplicated by others who had specific topics that concerned their communities. We do not own the formula anyone can use it. There is a parent group chat and a gifted and talented chat there was even a Portuguese Edchat. Social media affords many ways that individuals may address their community needs. If Edchat is not meeting your specific needs please use the same strategies and tools as #EdChat to meet your needs. That is EdChat as I understand it. That is as a founder, and a participant in all but a few of many EdChats conducted since August. You are free to comment here. I would hope that you will try to respond to what Edchat is, and not what others with far less EdChat experience say it is.